This weekend's release of Avengers: Infinity War is huge. We have never seen a film like this before. It is essentially the cliffhanger season finale of an 18-episode television show with a multi-billion dollar budget that has now spanned a decade. It is going to make an avalanche of money. I caught a Sunday showing in Indonesia and all six screens at the movie theater were only showing Infinity War. That a country like Indonesia, which is wary of market penetration by foreigners, is converting entire theaters into money-printing machines for Disney strikes me as pretty remarkable. Even with showings every 15-30 minutes, most shows were sold out hours in advance and the lobby was as packed as I have ever seen it. I was giddy with excitement as I entered the theater. And why not? Not since Who Framed Roger Rabbit has such a Murderers Row of IP been assembled in one film, elevating this movie to the kind of spectacle that is hard for anyone to turn down. Marvel has also been increasingly firing on all cylinders. Black Panther, Thor: Ragnarok and Spider-Man were all big hits and damn good films, striking a nice balance between the demands of the wider serialized plot structure and strong story-telling. More interestingly, for me, was that they also shrewdly experimented with tone and style in ways that worked like gangbusters and injected the Cinematic Universe with a lot of variety and texture. Doctor Strange delved into the metaphysical. Guardians took us to deep space where half the movie went down in the floating head of a giant ancient alien. Ragnarok features extended sequences on a trash planet. Wakanda has that cool Afro-futurism working for it. Marvel's team-up films like The Avengers and Captain America: Civil War have also been wildly successful. I read a review (which I can't find now so I can't link to it) where it was pointed out that the reason those films work is because the worlds of the different superheroes established in their standalone films were integrated together smoothly. Unfortunately, that kind of integration eludes Avengers: Infinity War for the simple reason that it cannot overcome the challenge of scale. Civil War and the Avengers brought together groups of bickering heroes and united them and divided them, but everyone got room to breathe and the stories unfolded in ways that made sense and seemed right given the scope of what the movie was going for. Infinity War's greatest weakness is probably that it is simply too big and too ambitious. It has too many moving pieces, and is trying to cram too many very different worlds together into a single, epic narrative. This is the most common criticism of the film: some of your favorite super heroes only get a few lines of dialogue, making their very presence in the film seem perfunctory. There is not enough time to juggle all the plates that the film tosses in the air, and it ends up bouncing around haphazardly. Moreover, films like Guardians of the Galaxy have been so successful at their own distinctive brand of world-building (where even the aesthetic sensibilities are quite different from, say a Captain America movie) that it is tricky for Infinity War to bring them back under the Marvel tent without it feeling jarring. A lot of critics have written some variation on the line "Even at two and a half hours, Infinity War seems rushed." And that is true. I have sympathy for the Russo brothers, because they were really handed an impossible task here. This is a crowd-pleasing film in which some of the biggest Marvel stars are essentially given glorified cameos simply so the audience can spot and recognize them. This means the film can never really slow down and breathe, and as such you lose a lot of what made Captain America: Civil War such a genius piece of filmmaking. The Russo brothers set themselves apart by executing slick, hard-hitting action set-pieces where even the second unit stuff was shot by an accomplished action hand. The result was some of the best action in the entire Marvel universe. When Cap smashed someone in the face with his shield, you felt that. All of that attention to detail is lost as Infinity War speeds toward its epic climax, swept up and traded in for grandeur and scale that is at times kind of numbing. Many of the action sequences in this film are underwhelming, awash with CGI and explodey magic energy balls. At the end of the day, even though this movie is a hell of a lot of fun as pure spectacle (there is a pretty great sequence in an interstellar space forge, for one), the balance just didn't seem right to me and it wasn't satisfying. And that brings us to the ending which I shall now spoil, so please stop reading if you haven't seen the movie. This film is a two-parter, and therefore difficult to judge without seeing how the long-game plays out. The most daring thing about this movie is the ending. The villain Thanos (played terrifically by Josh Brolin as a kind of melancholy force bound by a sense of duty to be evil) wins. This is a pretty direct rebuttal of all the criticism of previous Marvel films in which the heroes always defeat some sackless villain in a stakes-free CGI showdown. Not this time. The villain and his evil plan carry the day and about half of our heroes perish in the film's final moments. Shocking, right? Well, yes and no. Yes, it is a bold move to see some of our favorite characters suddenly vanish from existence. It is also nice that Marvel is trying to change things up by subverting its reputation for cookie-cutter climaxes and villains who never have any chance of winning. But we also know a lot of these big stars are still under contract (and that their franchises are still actively gushing money) and there is no way they are gone for good. We know they are coming back in the sequel, and we know that the heroes will ultimately team up and defeat Thanos. We can also be pretty sure that Tony Stark will end up sacrificing himself so that the rest of them can live. On a broad level, this will probably work once it is all assembled. 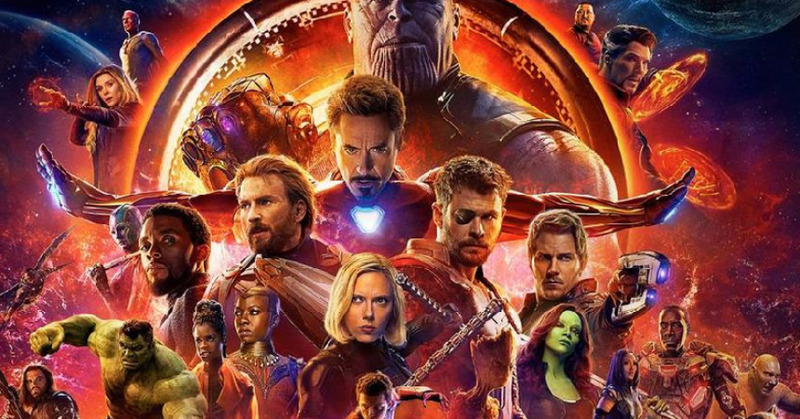 The heroes are down and out now, making their inevitable comeback and victory all the more satisfying (you will notice all the original Avengers are still left standing at the end of the film, meaning they will band together one last time to bring their friends back and overcome Thanos). But it also means that this movie is basically two and a half hours of set-up. I am sure the pay-off will be worth it, but the film and the filmmakers had to sacrifice so many other elements just to set up the stakes for that pay-off that one cannot help but wonder if such a massive event spectacle like this is really the right way to go. We can't answer that until we see the second half of this vision. What I can say now is that when I walked out of the theater last night I didn't have the same kind of satisfied feeling as I did after seeing Civil War or Black Panther or Ragnarok. Sure, the sheer scope of this epic saga will entertain and at times amaze you. But in the end, this movie is a whole lot of foreplay and nobody likes a tease.